With all the titles on display this year at gamescom, we once again teamed up with Adventure Corner to bring you far more coverage than we could have managed alone. And so, picking up from our first round of reports, we turn our attention to our German colleagues for the next installment from Cologne. Milanese developer Lunar Great Wall Studio has twelve employees, and they have been working for about a year on Another Sight. 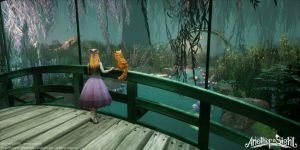 In this game, we control the blind girl Kit and a cat through a world where reality and fantasy mingle. In the gamescom demo, Kit awakens in a kind of subterranean cave beneath London. However, it is not a natural cave because in the background huge cogs are turning slowly. What is going on? She calls out for her father but does not get an answer. She is alone. Cautiously, she dares to advance into the tunnel and suddenly the ground gives in and she falls. As she lies unconsciously on the floor, a cat sneaks towards the girl. The feline wakes Kit up and wants to lead her somewhere. Slowly, Kit realizes that something is amiss – something fantastical. A magical shield forms around her. Is this a dream? She continues deeper into the underground world. When you look at this game, you involuntarily think of Alice in Wonderland. However, the true inspiration for Another Sight is Neil Gaiman’s Neverworld. It’s not only Kit’s clothing that seems similar, but also the setting that mixes reality and a fantasy world. Even the cut scenes have a comic book look that reflects its inspiration. The game itself emphasizes exploration, story and magical puzzles, and the further we descend into this unknown world, the more magic weaves itself into the adventure. The Italian developers stress that their focus is on the story, which should take about five hours to complete. In Another Sight, we are not only able to play as Kit but also as the more agile cat, with obstacles often focusing on the interaction between the two characters. You can always choose between the cat and Kit, and many puzzles need an action from one to let the other pass. For example, the cat jumps around acrobatically and activates a lever to let down a bridge so that Kit can cross a huge rift. Because of the fall and the magic surrounding her, Kit can only see in a very limited way, essentially “seeing” through sound. She has to feel her way slowly and, thus, in the demo, we often explored the world with the cat and meowed so that Kit could find her way. By doing this, Kit can even jump over small gaps which she normally cannot cross as she needs to see her landing spot. The typical gameplay loop we saw is quite simple: jumping around with the cat and pulling levers with Kit. The interplay between cat and blind girl is not everything this rather good-looking fantasy setting has to offer. Another Sight is set in the Victorian era and Kit will meet some familiar characters of that time, such as Tesla, Edison and more. She even gets to interact with these famous people and the developers want to make these conversations as realistic as possible; that is one of their utmost concerns. The whole adventure is accompanied by music from an orchestra in Salerno. Clearly, Lunar Great Wall Studio have not shied away from expense. The side-scrolling game will have English voice-overs and subtitles in other languages (including French, Italian, German and Spanish, according to Steam). The game has recently been released for PC, with console versions for PS4, Xbox One and Switch due to follow by the end of the year. Tales of the Neon Sea is a successfully crowdfunded adventure game from the Chinese development studio Palm Pioneer, to be internationally published by Zodiac Interactive. 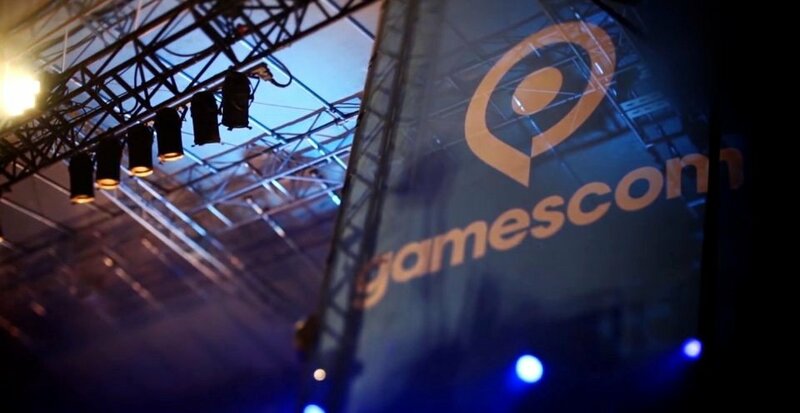 At gamescom we were able to take a look and even play certain parts for ourselves. This adventure is described as a traditional “point-and-click” but it gets by without the mouse. In the typical style of a retro 2D game, the character is controlled with WASD on the keyboard and interaction performed with “E”. You can also run with Shift. The pixel art presentation shines, literally, because of the gaudy style with brilliant colour and lighting effects. The three protagonists of this funny cyberpunk adventure are a detective, a robot (which incidentally looks like WALL-E) and a cat named William – yes, here we have another cat to control, this one complete with dialogues and everything you need. 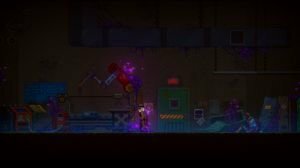 At first sight, the game seems to be a side-scrolling platformer. However, calm down, as that is not the case. Jumping is not even possible except at some pre-scripted spots, and while we were playing we were never reminded of a run-and-jump. On the contrary, Neon Sea has many puzzles that vary between searching for certain items, combining them with the environment, and mini-game activities. Let us look at an example: We saw a generator that is supposed to produce energy. Of course, we needed to examine the generator to get it to work and found three knobs that we had to turn in such a way that the correct energy level was created – a classic logic puzzle that is well-known across many games. Despite the complexity of challenges to overcome, the game does not have an inventory. Obtained items are instead stored invisibly and are used automatically when needed. As the main protagonist is a detective, standard investigative work is also prevalent. We examined a dead body with the cursor, and thanks to the detective's implants, we could also use a magnifier and x-ray sight to look for clues on the corpse. When we found enough evidence, we were able to combine it together for an overall autopsy (thanks, cyberpunk technology!). And that is not all concerning puzzles. Once we had the autopsy, we needed to reconstruct the course of events. We had to somehow turn back time, and thus a small clockwork puzzle with different-sized cogs came up. After solving it, we witnessed the whole crime via “augmented reality” in hologram form. The dense atmosphere provides a good setting for the action, but the seriousness of the game is lightened by smaller cool and funny scenes. Once, when controlling the cat, we had to ask for the support of the local cat mafia. William also has his own mini-games and even a dialogue puzzle to solve. But speaking of dialogue, there is no voice-acting in Tales of the Neon Sea. Befitting the retro look, we only had subtitles to read. Thanks to the successful Kickstarter campaign, we can look forward to the game releasing on multiple platforms with a “season ticket” available for purchase. The larger story is self-contained, but since the protagonist is a detective, the game lends itself to offering optional downloadable cases via the season ticket. Tales of the Neon Sea will be released in the fourth quarter of 2018 on PC, with specific consoles still to be determined, though the developers assured us that they want to make a Nintendo Switch version. The Gardens Between is the upcoming adventure game project of The Voxel Agents. As it will be released on September 20th, it could be played completely on Nintendo Switch at gamescom, though it will also be available for PC and PS4. The most unique element in The Gardens Between is that you do not control the two child protagonists directly. The girl and boy walk through each level, or garden, on their own towards the top. What players control is time and, thus, indirectly the protagonists. By pressing Left / Right you rewind/fast-forward time until the desired moment is reached, and with another press of a button, the protagonists will interact with the environment. For this game mechanic, the developers were inspired by the movie Minority Report, and they tried out different prototypes until coming up with the current iteration. Simple as it is, the goal for every level is to get the light from your lantern to the top. You neither have any time pressure, nor can you fail or die. You just have to solve the environment puzzles along the way. In the process, The Voxel Agents want to encourage players to observe the world around them to get deeper into the story. Careful observation should also lead you towards the solution of each puzzle by rewinding / fast-forwarding time – or even pausing time. It sounds quite simple, but trust me, it took us a while to figure some levels out. Most of the storytelling is done environmentally. Every level represents a stage of friendship between the two children. Once you finish a level, you unlock “star constellations” and after some levels even story bubbles. These bubbles are cutscenes, the only explicit bit of exposition. In The Gardens Between, everything revolves around friendship. By solving the puzzles, you are able to replay the story of the kids’ friendship and nearly every object on display represents some aspect of their relationship, such as a VCR, a game console or simple moving boxes. The developers want to encourage players to think about their own childhood while playing, and the things that reflect their own friendships. In that sense, the game should be a fairly leisurely experience that is also very relaxing to play. The stylish, good-looking visuals and the ethereal background music emphasize this experience as well. The Voxel Agents had good reason for wanting to release the game on Switch, given its different control possibilities. Using both Joycons, only one Joycon or a dedicated controller is possible. On PC the game will be just as versatile, however. We were promised that nearly every controller with an analogue stick will work with the game. Furthermore, the arrow keys and space bar work fine too. Currently, no tablet or mobile versions are planned, but the developers see the potential of these platforms too. 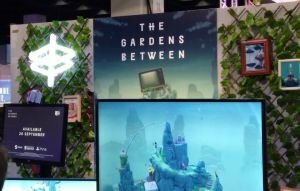 The four-person team has been working for about four years on The Gardens Between, which has 21 levels and should take about 2-3 hours of gameplay to complete. They said that the story is the main reason why it is so short, because they want the experience to be as crisp and diverting as possible.